Designed to help increase the natural blood flow around the muscle, Mueller Kinesiology Tape features a revolutionary wave pattern adhesive that moves with the skin and muscles. Kinesology Tape is used by professional athletes and Olympians to help reduce muscle pain, increase mobility and enhance recovery. 100% high-grade cotton tape. Latex-free, breathable, elastic and maintains flexibility. 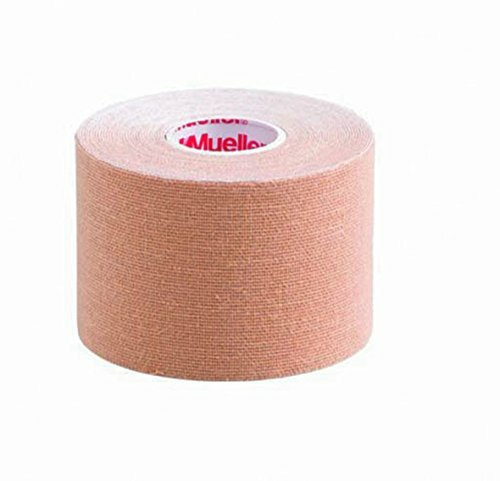 Mueller Kinesiology Tape features a revolutionary adhesive design that lifts the skin to help maintain flexibility, improve circulation, and relieve pain. Designed to aid in the treatment of ligament injuries, muscle conditioning, fascia repositioning, and even carpal tunnel syndrome, it is applied to the skin in patterns to mimic your muscles. Each roll is 5cm (2") x 5m.